WAMPEX 2018 and its co-located conference WAMPOC opened in spectacular style today (May 30) with a record breaking number of first day visitors. 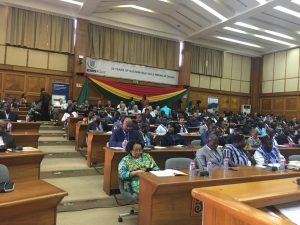 It is the centrepiece event for the mining sector in West Africa and His Excellency President Nana Addo Dankwa Akufo-Addo arrived as the doors opened supported by senior government officials. 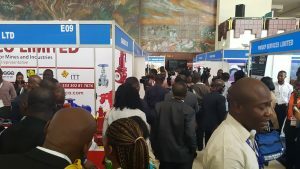 He was there to help mark the 90th anniversary of the Ghana Chamber of Mines and took time to meet exhibitors in his country’s capital Accra. The President has made mining in his country a top priority since he took office just over a year ago and he is showing leadership for the whole of West Africa pledging both strong support alongside a renewed environmental awareness. He spoke to first day delegates at the West African Mining & Power Conference, which runs over two days alongside the three-day expo. The President said “the distressed state of communities in which mining companies operate is nothing short of a disgrace and we must work to change the situation”. Exhibitors were pleased with the both the presidential support and the number of visitors on the first day. Johannes Kast is Regional Sales Engineer for FLSmidth who arrived from Austria. His company is a first-choice partner for business operating in the mineral and cement industries. It is tightly focused on two core areas: selected minerals industries and cement industry and can be found on Stand E04. Meanwhile on Stand B02 Bull Construction Equipment were showing its world class dedicated construction equipment vehicles from India, where it is the country’s number one supplier of tractor equipment. Gurminder Singh Malik is Bull’s President of International BusinessStrategy who said: “WAMPEX is a great way to network with the regional mining industry. Doors open at 10am at the Accra International Convention Centre for day two of this prestigious mining and power event.